This is the second article on avoiding certain errors at the early stage of code writing. In the previous post, we have already advised you to avoid a large number of calculations in one expression. However, we should investigate this question in detail. Let's see what's dangerous about complex expressions and how we can avoid many logical errors. You may read the previous post here. This time we'll take error samples from various famous projects to stress their prevalence. The errors I'm going to demonstrate here were found with the help of the PVS-Studio analyzer during a relatively large term. I have informed developers of almost all of the projects about the errors, so I hope they will fix the defects in new code revisions. I'm writing this in introduction because I always receive letters after publishing articles with a request "please inform the project's developers about the errors you've found". 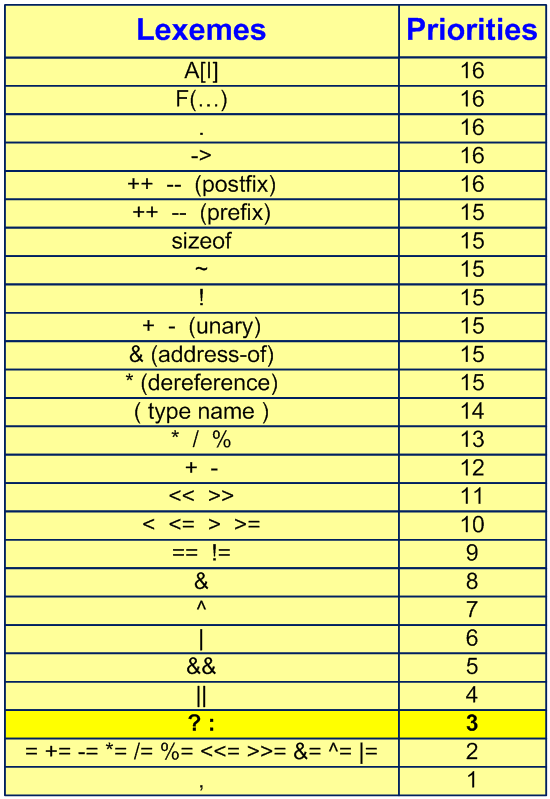 A ternary operation has a very low priority (see the table). Programmers often forget about it and that is why the ternary operation is quite dangerous. What occurs to you first is that you just should know the priorities of operations. Well, programmers do know them but too insidious is this ternary operation! Not only novices make mistakes with it but experienced programmers as well. You may easily find them even in the most quality code. Here are a couple of examples. As you may see, errors of this type deserve consideration. That is why I've made a separate paragraph to describe them. They are quite widely-spread. I could give you some more examples but they all are similar. You can avoid such errors if you give up trying to place several operations into a single line of code. Or if you still want to do that, do not be greedy to add parentheses. I will speak of parentheses a bit later. Now let's try to avoid potential errors when using '?:'. You may disagree with this recommendation and I will not defend it. For instance, I myself do not like having two lines or more instead of one line. Another nice alternative is the obligatory enclosure of the '? :' operator inside parentheses. The main task for me is to show you error patterns, but it depends on programmer's preference what pattern of error protection to choose. It has become a custom for some reason that using additional parentheses in C/C++ programming is considered something shameful. Perhaps it is because the question about operations' priorities is often asked at interview and people subconsciously start trying to use the priority mechanism to the full extent all the time - if he makes additional parentheses, they will think he's a novice and not a true Jedi. I even came across a discussion on the Internet where some man was too dogmatic saying that using additional parentheses is a bad form and that if somebody is not sure about the way an expression will be calculated, he must study instead of writing programs. Unfortunately, I've failed to find this discussion but I do not agree with such opinions. Of course, you must know priorities but if you use heterogeneous operations in an expression, you'd better use parentheses to secure yourself from errors. This will not only protect you from potential errors but make code readable for other developers. Not only novice programmers but also skillful ones make mistakes caused by confusion of priorities. An expression does not necessarily need to be quite complicated and long; you may make a mistake in relatively simple expressions. Let's consider some examples. The expressions are simple. The developers are attaboys. Still there are errors. So, using parentheses in slippery fragments will not be superfluous. Exploiting parentheses when using rare operations will also help you with the "? :" operator discussed above. How we should handle "? :" is a matter of taste. Personally I like the method of simplification. Write simple and clear code. Splitting long and complex expressions into several strings you get longer code. But this code is much clearer to read and comprehend. It is less probable that you will make a mistake in such code. Do not be afraid to create an additional variable - the compiler will optimize the code well. Do not be greedy about using parentheses in expressions where rare operators are used or where bit and logical operations are mixed. A programmer who will read your code with parentheses in the future will only be grateful to you for it.